The shoe is very sporty looking, all black with a grey swoosh. The full-grain leather is extremely comfortable and gives you a snug fit. It has an air unit in the heel for extra shock-resistant cushioning, and a full-length Phylon midsole for overall lightweight cushioning. The Nike Power Platform Flex is a cool feature. This power channel helps give your golf swing power by freeing up your foot for optimum balance and a smooth weight transfer. My favorite thing about the shoe is that it is 100% waterproof. Rarely do I come across a sporty golf shoe that is both ultra lightweight and also totally waterproof. Usually, this is a trade-off because most shoes that are completely waterproof are made of heavy and bulky material. That's not the case with the Nike Air Tour. What's more is, this shoe comes with a 2-year waterproof warranty. 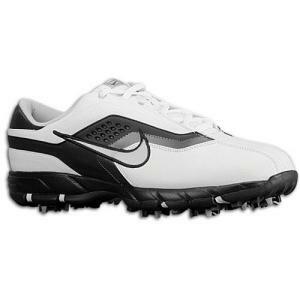 I would recommend this shoe to all golfers. It is a fantastic shoe at a cheap price.